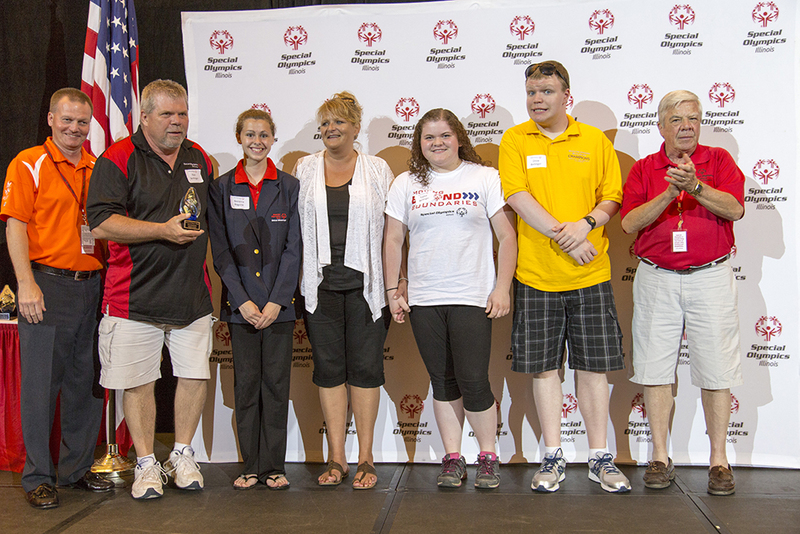 The Bellinger family of Marquette Heights has been named 2015 Special Olympics Illinois Outstanding Family of the Year. The family were honored at a reception held June 12 before the Special Olympics Illinois Summer Games Opening Ceremony at Illinois State University in Normal. The Outstanding Family Award recognizes a family with a Special Olympics athlete that has made unique and lasting contributions not only benefiting their athletes but also every aspect of the Special Olympics Illinois program. Ron and Eva’s son, Andrew, is the reason the Bellinger family got involved in the Special Olympics. Andrew first started competing with Special Olympics Illinois in 2004 at the age of 9. He competed for Tri-County Independents in speed skating. Andrew now competes in basketball, bocce, bowling and softball with Heart of Illinois Special Recreation Association (HISRA). Ron and Eva are involved with Special Olympics Illinois year-round, in a variety of roles including coach, volunteer and fundraiser. Beginning in January, Ron and Eva work with the SOILL Heartland/Area 6 Basketball Skills Competition, staging the athletes for basketball skills. In February, Eva volunteers at Winter Games running an awards area. In March, Ron is a volunteer official for a number of basketball games at HISRA, when he and Eva aren’t coaching their son’s basketball team, the HISRA Gators. Bocce takes up most of the time the Bellingers have in the spring. In April and May, Ron and Eva help plan the SOILL Heartland/Area 6 Spring Games. Ron and Eva are present at the Outdoor Sports Festival in September, where Eva runs an awards venue and Ron coaches and officiates softball games. In the fall and winter, the Belllingers can be found volunteering at Area, Regional and State bowling competitions. And, Ron and Eva have enlisted granddaughter Taylor to the Special Olympics family – she has been Drew’s Unified bocce partner and volunteers at many events. 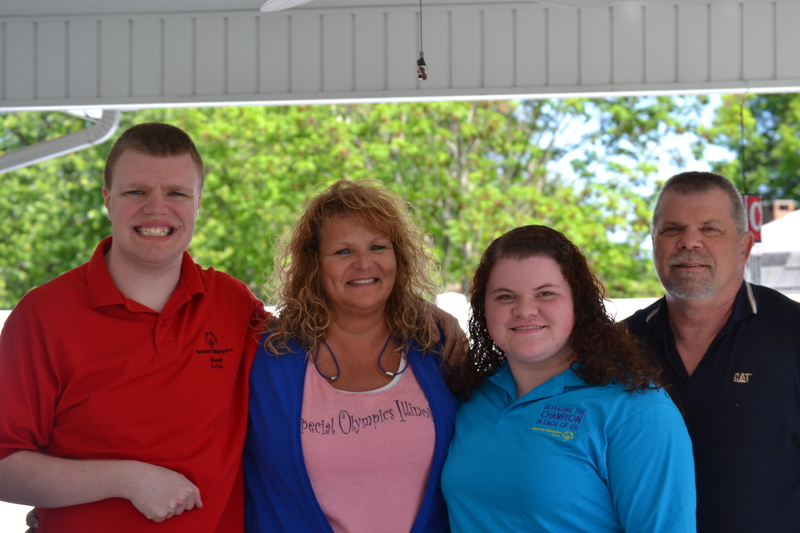 The Bellinger family dedicates innumerable hours to Special Olympics Illinois, say their nominators. They constantly strive for the athletes and others involved with the organization to achieve greatness. Special Olympics Illinois is a not-for-profit organization offering year-round training and completion in 19 sports for nearly 22,000 athletes with intellectual disabilities and nearly 21,000 Young Athletes ages 2-7 with and without intellectual disabilities. Special Olympics transforms the lives of people with intellectual disabilities, allowing them to realize their full potential in sports and in life. Special Olympics programs enhance physical fitness, motor skills, self-confidence, social skills, and encourage family and community support. If you are interested in learning more about Special Olympics Illinois, volunteering or providing financial support to help make Special Olympics programs possible, contact your local Special Olympics agency, call 800-394-0562 or visit our website at www.soilll.org.